The impressive post-crisis rebound in Latvia's tourist industry shows no sign of slackening with figures for the third quarter of the year showing double-digit growth continues. 964,100 visitors stayed at Latvian tourist accommodation establishments in the 3rd quarter of 2017, which is 11.8 % more than during the respective period of 2016 according to latest data compiled by the Central Statistical Bureau (CSB). Compared to the previous year, the number of nights spent by visitors increased by 14.4 %, reaching 1.86 million. The average length of stay comprised 1.9 nights. The majority of foreign visitors came from Germany (92.5 thsd), Russia (74.4 thsd), Lithuania (72.0 thsd), Estonia (51.3 thsd), Finland (48.6 thsd) and the United Kingdom (29.3 thsd). 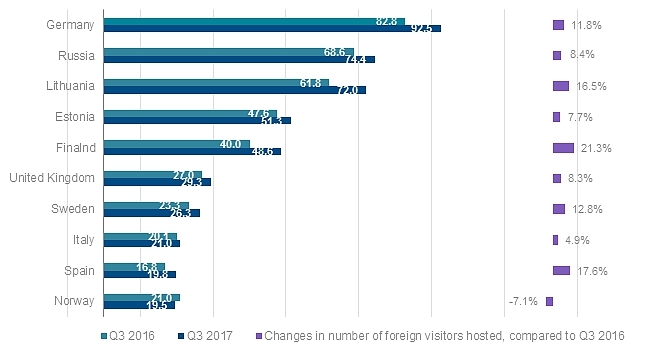 During the 3rd quarter of 2017, significant increases were observed in the number of visitors coming from Canada, Switzerland, Austria, China, Finland and Israel. Reductions were observed in the number of foreign visitors from Norway, the Netherlands and Belarus. Out of the total number of foreign visitors, 31.5 % or 207.6 thsd came from the neighbouring countries of Latvia – Russia, Lithuania, Estonia and Belarus. Out of all foreign visitors, 71.1 % stayed in Riga, 9.3 % in Jūrmala, 2.4 % in Ventspils and Sigulda county, and 2.1 % in Liepāja. It all augurs well for the Christmas and New Year holiday season with Riga recently named the best-value seasonal destination in Europe.